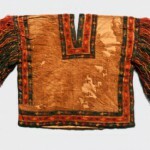 Sometime around 1973 a 2000-year-old textile was stolen from Peru’s National Museum in Lima. The piece, a mantle measuring 3.5 meters by 1.5 meters, was one of three that were taken (Cochrane 1989; Thew 1989). The mantle had been excavated by acclaimed Peruvian archaeologist Julio Tello in 1927 at the archaeological site of Cerro Colorado. It was found on “mummy 319”, one of over 400 Paracas culture mummy bundles recovered by Tello and his team during their years of digging at the site (Thew 1989). Details about this textile, designated WK 319-10 (read: the tenth textile catalogued on mummy bundle 319 from the Wari Kayan necropolis) are available via the Paracas Archaeology Research Resource (Peters n.d.). The Australian National Gallery (now the National Gallery of Australia or NGA) purchased the mantle in 1974 in London from a US-based dealer (Cochrane 1989; Thew 1989), paying a reported $35,000 AUD for the piece on behalf of the Australian Government (QNP 1989). 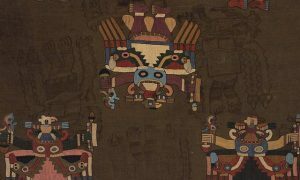 Professor Jane Dwyer of Brown University, an expert in Peruvian textiles, noticed the NGA’s purchase. She identified the NGA mantle as one that she had recorded and photographed in detail in Peru’s National Museum in the late 1960s (Cochrane 1988). She notified Peru of the purchase and the Peruvian Government, having confirmed that the mantle was one of those stolen from their museum, asked for the its return in 1982 (Cochrane 1989). The NGA and the Australian Government reportedly “refused to accept the mantle was stolen”, denying Peru’s claims (Thew 1989) and initiating seven years of continued repatriation demands from Peru. In response to 1988 media reports that Peru had, again, demanded the mantle’s return, the NGA issued a statement denying Peru’s claim. Saying that they were “anxious to put this matter to rest”, the NGA stated that they had examined photographic negatives of the stolen textile (presumably supplied by Dwyer) and that although “there were similarities in the overall design”, there were differences between the piece photographed and the piece they held (quoted in Cochrane 1988). They also said that Peru’s Ambassador to Australia had issued them a letter on 4 August 1982, confirming that the NGA mantle was not one of the textiles stolen from the Lima museum. 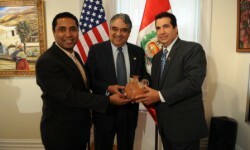 Shortly after the NGA’s statement, the museum was presented with what they described as undeniable evidence that the mantle was the property of Peru and had been stolen from that country’s National Museum. Despite this evidence, it was not immediately clear if the museum would be forced by law to return the mantle. In 1986 Australia passed the Protection of Movable Cultural Heritage Act which controls the export and import of cultural heritage items (Australia 1986). Section 14.1 of the Act states that when a protected object was unlawfully exported from a foreign country, the piece is liable to forfeiture. However, as the mantle entered Australia before this law took effect, the museum as a good faith purchaser could have argued that the textile’s import into Australia was not prohibited at the time. This argument, however, was not tested at the NGA and the Australian Government agreed to return the stolen mantle to Peru in October 1989. Australian Arts Minister at the time, Clyde Holding, stated that even though they may not have been compelled by law to return the textile, be believed that “it is important to abide by the spirit of the legislation and return this significant piece of Peru’s cultural heritage to the people of Peru” (Holding quoted in Thew 1989). Peru’s Ambassador to Australia at the time called the return “an act of fair play, typical of the Australian people” (quoted in Greenfield 2007). The NGA maintained that they always had good intentions and that their investigations into Peru’s claims for the mantel were “hindered by the fact that both the dealer who sold us the mantle and an American anthropologist who alerted the Peruvian Government to our purchase [Dwyer] had died” (Lillian Harrison quoted in Cochrane 1989). The dealer’s death also prevented the Australian Government from recovering any of the money that they had spent on the textile (Thew 1989). The picture accompanying this encyclopedia entry has been provided by Ann H. Peters who runs the spectacular Paracas Archaeological Resource. It shows a detail of the pattern of Wari Kayan 319 specimen 11, which the stolen and returned mantle (Wari Kayan 319 specimen 10) covered on the original mummy bundle. If you look closely you will see darker coloured patterns, almost shadow-like, on the textile pictured. These are the stains of the pattern of the stolen and returned textile, transferred to this one beneath it, during the approximately 2000 years that the mummy bundle rested in the Paracas necropolis at Wari Kayan. Thus, not only were there photographs and drawings of the stolen and returned mantle in existence when Australia bought the piece, there was another textile still within Peru’s national collection bearing the exact imprint of the one stolen. Thanks to Ann H. Peters for this image and this information. Cochrane, Peter (1988) Wrong Mantle, Claims Gallery. Sydney Morning Herald 26 September. Cochrane, Peter (1989) Art Gallery Gives up ‘Hot Mantle’. Sydney Morning Herald 24 October. Greenfield, Jeanette (2007) The Return of Cultural Treasures. Cambridge: Cambridge University Press. QNP (1989) ‘Hot’ Relic Goes Back. Queensland Newspapers 24 October. Thew, Helen (1989) Peru regains lost heritage: Govt returns 2000-year-old stolen shroud. AAP. 24 October.